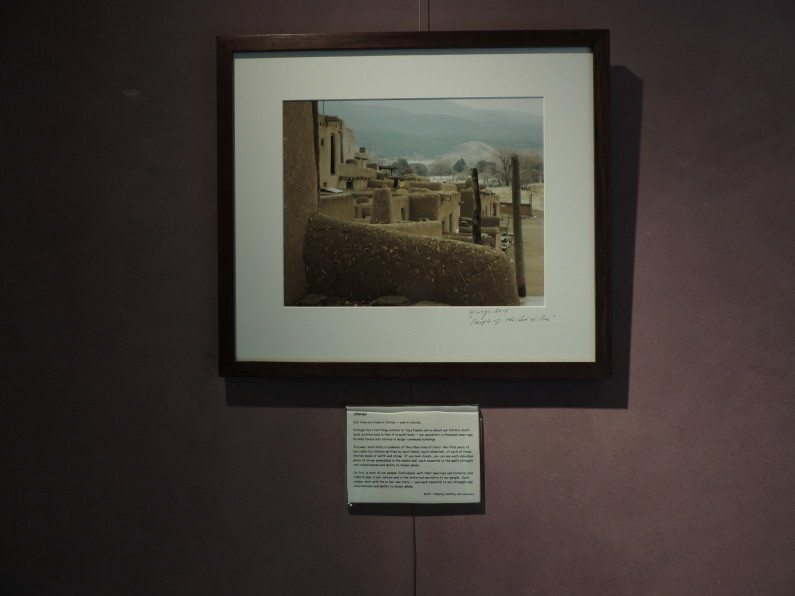 “Taos Pueblo: Ancestral Places, Sacred Spaces.” The Photography. Welcome to Wings’s online photography exhibition from his recent one-man show, Taos Pueblo: Ancestral Places, Sacred Spaces. Below, you will find digital versions of each of the photographs that appeared in the exhibit. During the period of Wings’s exhibit, as you entered the coffeehouse at the Jean Cocteau Cinema, you would have seen photographs arrayed on the walls to your immediate left, and across the room on the right. Mindful that people read English from left to right, Wings placed his images in a particular order beginning on the left wall, each image a chapter in the larger story he wished to tell. Seven photographs (five smaller; two larger) hung on the longer space on the left; three large ones were evenly spaced on the shorter wall to the right. Each photograph was accompanied by interpretive text beneath it, providing context for the image from his personal perspective. I’ve reproduced his text here, beneath each image, followed by size and pricing information. Please note: The smaller photographs themselves, as originally produced, were 11″ by 14″; the larger ones were 12″ by 18″. Some minute cropping occurred prior to production, and matting further reduced the visible images by about an inch overall: The visible image of the smaller photographs is roughly 10.5″ by 13.5″; of the larger ones, it is roughly 11.5″ by 17.5″. Each photograph is signed on the lower right corner of the white matting, and reads “Wings, 2014; People of the Red Willow.” The smaller photographs are framed in a rich brown wood; the larger ones, in a black wood that was ordered specially for these pieces. The smaller photographs are $625 each, plus $100 shipping, handling, and insurance. The larger ones are $775 each, plus $125 shipping, handling, and insurance. Special packaging and handling are required to ensure safe transit. For unusual circumstances, such as overseas shipments, the cost will be higher. We also have 8″ by 10″ prints of each of these photographs, made available in a limited run of 100. Each is signed and numbered on the reverse, no matting, backing, or framing. Cost is $100 per print, plus $10 shipping, handling, and insurance. Now, come with us. Let us take you on a tour of the ancestral places and sacred spaces of Wings’s people and culture and everyday life. Posted on Sunday, June 15th, 2014 at 11:59 am. Filed under: Taos Pueblo: Ancestral Places, Sacred Spaces, The Photography	RSS 2.0 feed.